Kesseböhmer breathes new life into the ‘dead’ corner. 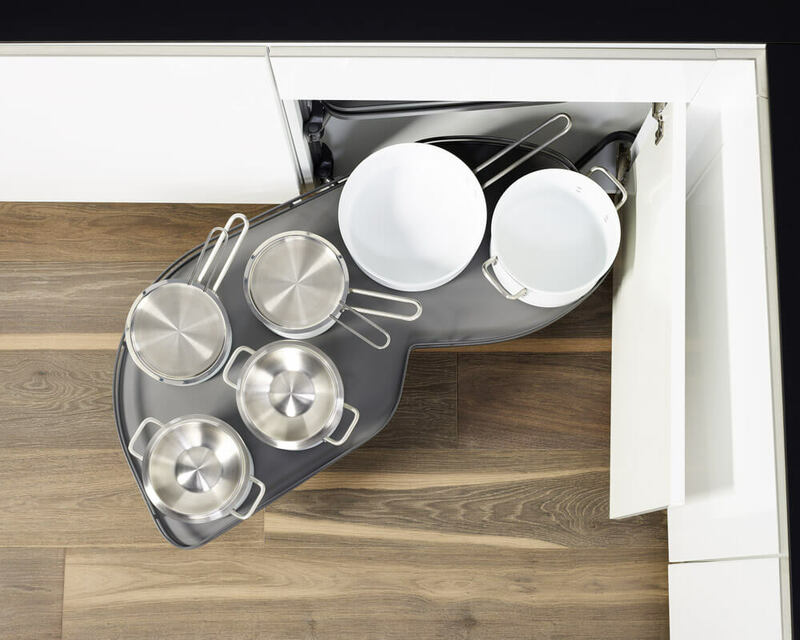 With the LeMans corner cabinet pull-out, the company is putting forward a solution brimming with persuasive features that is being very well received. Live demonstrations see various kitchen corner solutions pitted against each other in direct comparisons. Results have shown that the LeMans offers up to 70 per cent more storage space than a cabinet with pull-out shelves when it comes to the ‘dead’ corner space. Each tray can support up to 25 kg with ease! 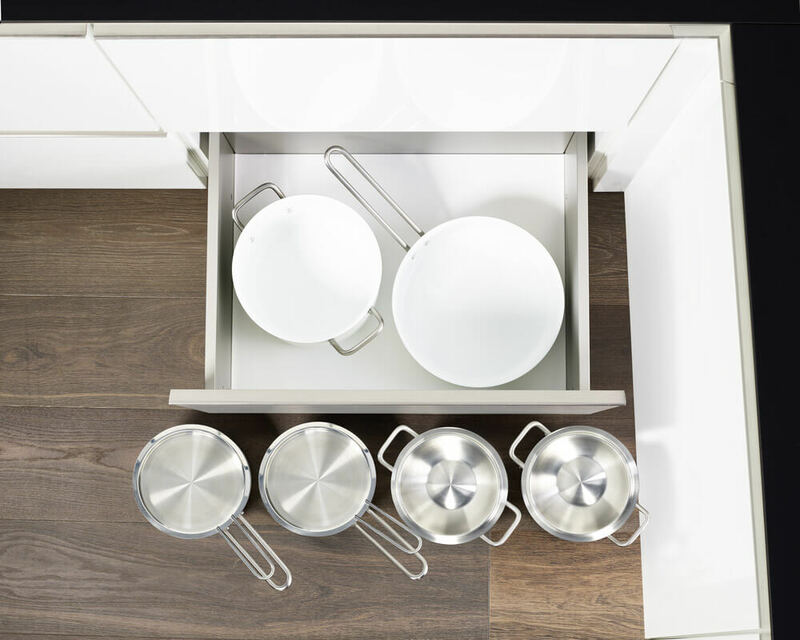 LeMans allows the otherwise ‘dead’ corner space to be exploited to its full potential by offering an elegant and perfectly designed motion combining turns and rotations that brings the entire cupboard contents to the front of the unit. 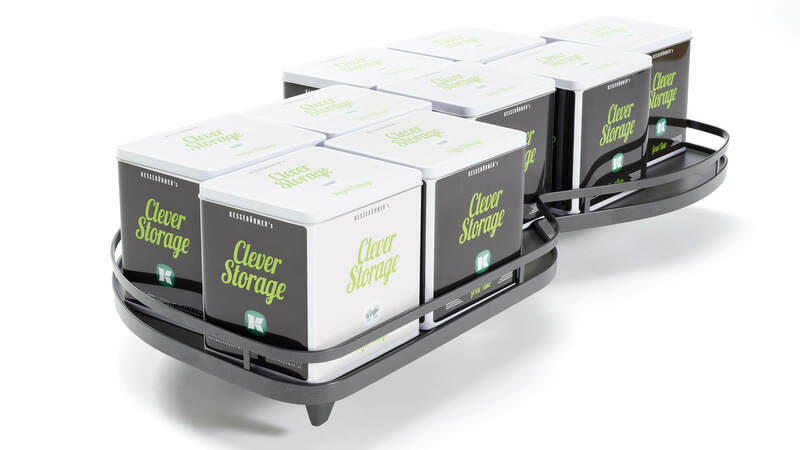 Each of its trays can be pulled out individually and fully. 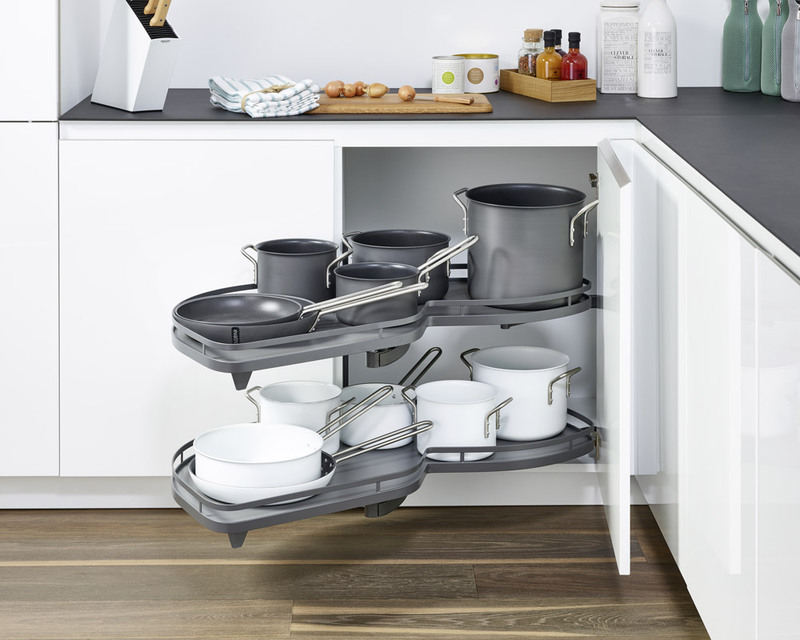 The high-quality workmanship means even particularly heavy pots and pans can be stored in this space-saving solution, as each tray can support up to 25 kg with ease. Kesseböhmer is presenting a direct comparison of two similar designs for the 60 cm base units in its current documentation for trade and industry, illustrating the differences in pure shelf space. One of these designs is the LeMans with two trays plus a drawer, while the other features two pull-out shelves and a single drawer. These three levels offer nearly 21 percent gain in space in the LeMans, with this figure rising to 31 per cent for two levels even without taking the drawer into consideration. The geometry of the trays is reminiscent of the French 24-hour race track and can even offer up to 70 per cent more storage space than a cabinet with pull-out drawers in the ‘dead’ corner. 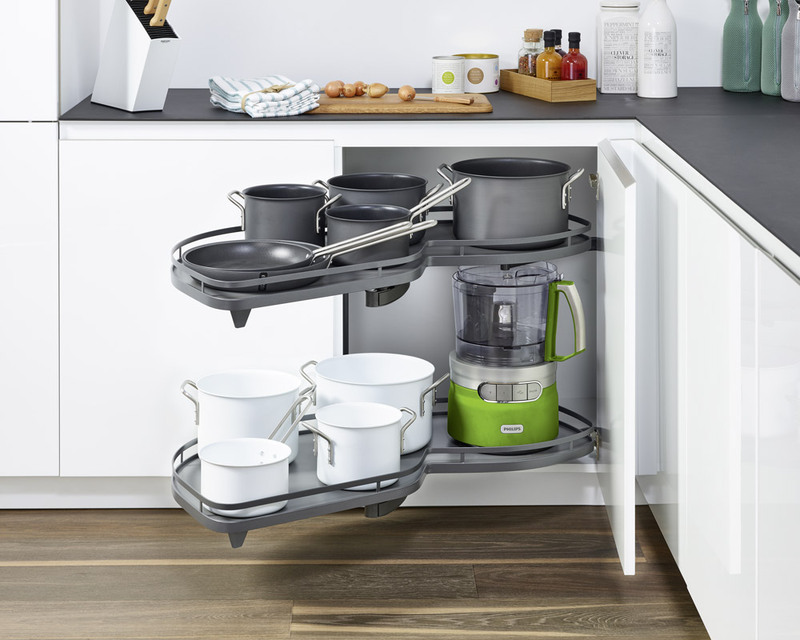 The rounded shape is ideal for accommodating pots and pans, which can even extend out beyond the rail in the LeMans to save even more storage space. 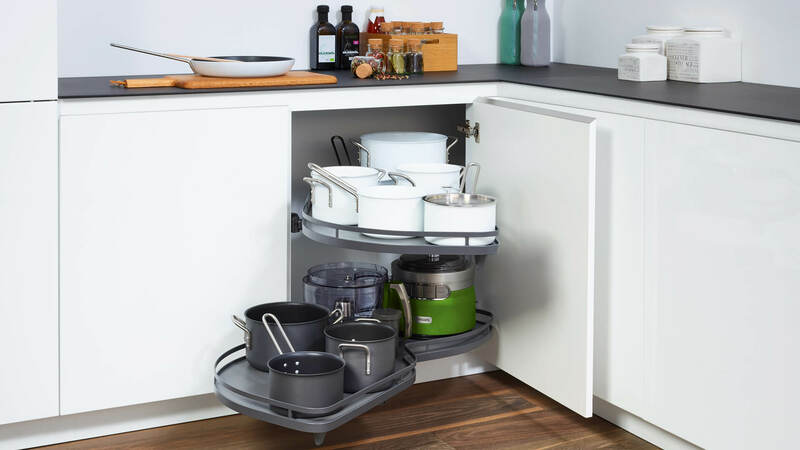 The adjustable height options create the optimal storage space for any high-sided pan and ensure everything is always within easy reach. … even for high-sided pans! In addition to being a base unit fitting, the ‘LeMans’ is also available for highboards and larder units. The patented four-arm-joint technology guides the trays smoothly and reliably in each configuration. What’s more, the cushioned self-closing mechanism ensures quiet closing even at maximum load.